There are two common species of asparagus beetle: One is blue-black, and the other (shown here) is orange with black spots. Larvae are greenish-gray hump-backed grubs with dark heads. 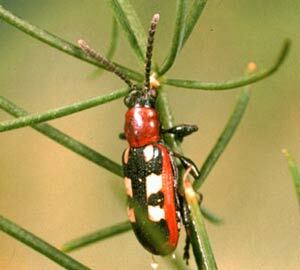 Adult beetles emerge in early spring to lay numerous shiny black eggs on asparagus shoots; eggs hatch in about a week. Early in the season both adults and larvae feed on developing spears, and move on to the ferny foliage as the season progresses. There are two to five generations per year, depending on the climate. Handpick adults or knock them into a container of soapy water. Spray an insecticide containing neem oil at the first sign of infestation and again in early fall as directed by the product label. Birds feed on beetles and ladybug larvae prey on larvae and eggs. Remove plant debris from the garden to reduce overwintering sites.